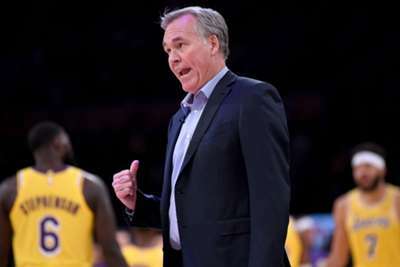 Houston Rockets coach Mike D'Antoni expects the NBA to take the appropriate disciplinary action following the brawl in his team's win over the Los Angeles Lakers on Saturday. Brandon Ingram, Rajon Rondo and Chris Paul were ejected late in a highly-charged encounter at Staples Center. Lakers point guard Rondo has reportedly denied accusations that he spat at Houston's Paul during a 124-115 victory for the Rockets. Punches were thrown after Ingram pushed James Harden, overshadowing LeBron James' home debut for the Lakers. D'Antoni watched on as the melee unfolded and the Rockets coach has faith that the NBA will handle the issue. "I saw it from a distance, I wasn't getting in there. I had glasses on, I couldn't go in there," he told reporters. "Stuff like that, the NBA will sort it out. It was some heated stuff. I'm sure spit was thrown. "When you cross the line, it happens. The NBA will sort it out and they will do a good job."